As the nation mourns the death of more than 200 flood victims with dozens still missing 14 more people have now died and thousands treated in hospital from a crippling heatwave. 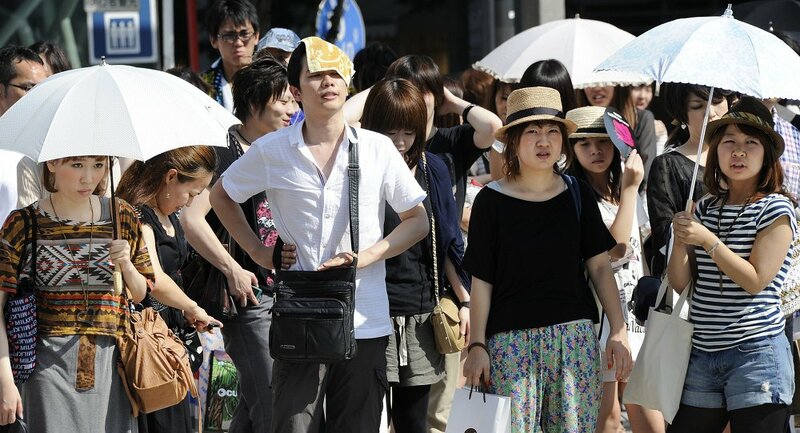 Temperatures on Monday, a national holiday, surged above 40 degrees Celsius (104 deg Fahrenheit) in some inland areas and combined with high humidity to produce dangerous conditions, the Japanese Meteorological Agency (JMA) said. At least 14 people died from the heat over the long weekend, media reports said, including a woman in her 90s who was found unconscious in a field. Thousands more were treated in hospitals for heat-related conditions. The heat was most intense in landlocked areas such as Gifu prefecture, where it soared to 40 degrees Celsius (104 deg Fahrenheit) in the town of Ibigawa on Monday - the hottest in the nation. The capital Tokyo recorded a high of 34 Celsius on Monday. Temperatures in parts of western Japan hit by deadly floods reached a high of 34.3 Celsius by midday on Tuesday, creating dangerous conditions for military personnel and volunteers clearing mud and debris. All we can do is keep drinking water," one man in Okayama told NHK television. Temperatures of 35 or above - known in Japanese as "intensely hot days" - were recorded at 200 locations around Japan on Sunday, the JMA said, which is unusual for July but not unprecedented. Similar scorching temperatures were reported from 213 locations on a July day in 2014. The current heatwave was due to the layering of two high-pressure systems over much of Japan and is expected to continue for the rest of the week if not longer, the JMA said.